The more you share, the bigger your car! It's never been easier to drive home a new car! In November, we want to break records for sponsoring. The more people you sponsor, the more tickets you'll earn, and the better chance you have of winning a more luxurious car. With just three qualified sign-ups (any sign-up with a minimum order of 40 QV), you will be entered in the drawing for a new car. Each registered Member and Manager who directly sponsors at least 3 qualified sign-ups in November will receive a special promotional sponsoring kit. This kit will include useful product flyers, cards and brochures, plus helpful business tips and suggestions. Designed with sharing in mind, this unique sponsoring kit will be merged with your next order placed directly with NSP after December 15, 2008. Don't forget, NSP has promised to give away a second car—the Volkswagen Beetle—when we reach 15,000 new Member sign-ups in any month! Get one ticket for each September and October sign-up who reorders in November. Earn one ticket for every Education Week Webinar you attend Nov. 17–21. Attend all five and get 10 drawing tickets! Be a manager by the end of November. Register for Driven to Share (above). Sponsor at least three new Members (minimum 40 QV in sign-up order), and you will receive three tickets. Receive an extra ticket for each additional qualified sign-up that you sponsor in November (up to 15 tickets). Please call me if you have any questions regarding the above information. I have sent you a Jacquie Lawson electronic Thanksgiving card. Please click on the following link to see your card. If your e-mail program has not displayed this as a link, then please copy the following into the Address or Location bar of your Internet browser. ANOTHER FDA/GOVERNMENT ATTACK ON OUR RIGHTS! I find it very hard to believe that we are constantly fighting for our rights to choose nutrition through foods, herbs and supplements. The FDA and all who support this constant attack on the Natural Health industry has to be stopped. Whole organic foods, Natural supplements and herbs provide the nutritional means to a healthier future. Yet the natural health industry which delivers better health to millions daily is always being attacked while the multi million dollar medical industry which provides toxic chemical poisons and death to Americans on a daily basis has more rights than those of us who just choose to use what our Lord has provided for us. Fruits, vegetable, herbs.. these have been here for millions of years and have been given to us by this earth and by our maker. Yet greed throughout the government continues to fight our rights to choose that avenue. The greed of this nations FDA and government agencies which support this constant turmoil is appalling. The FDA should be concentrating on the pharmaceutical world and removing the thousands of chemical medications which kill EVERY day. The FDA should be held accountable for every death they have been responsible for by approving the chemical drugs which they allow these pharmaceuticals and doctors to distribute around this world. Their focus is so tainted by their greed. THE DSHEA protects our rights and the FDA needs to step back away from its ridiculous attempts to take away our rights. Americans have the right to choose natural health through nutrition. Our right to teach about Natural Health is imperative to this nation. Please read below and submit your comments. Please vote for your rights to choose your means of health and nutrition! Don't depend on someone else to do it for you. We need to all fight for this important issue or our rights are going to be taken away from us! Supplement Have Ever Been Published!" literature, as part of any medical study. the food [and supplement] supply. Mark Your Calendar Now for These Exciting NSP Sales Events in November! Each night November 17th - 21st, during our Education Week Webinars and Teleconference calls, Nature's Sunshine is allowing us to purchase some of the products talked about during the calls, at a wonderful discount. I will continue adding the specials each day as we are given the special promo numbers, so make sure you check back each night to see if your favorites are being offered on special. November 18 and 19 Only! Offers immune system support without the risk of heavy metal contamination. Support brain function, memory and concentration and promotes optimal circulation to the brain. Helps to maintain the integrity and mobility of joints. SPECIAL END OF WEEK PROMOTION! Make sure to bookmark this page so you can check on additions to this list. "I 8 2 MUCH" DAY AFTER THANKSGIVING SALE! Start the Shopping Season off right with top-selling products to support digestion and cope with holiday stress! Helps to support the digestion of proteins, carbohydrates and fats. Aids in the breakdown of most types of foods. Supports the body during times of stress. May help support immune response, strengthen cells and deodorize the body. Big Savings Now through December 31 Only! Buy a 12-piece NatureSeal pan set and get $50 off plus a free 2-cup pan! The following set is available only while supplies last! Free NSP Product for Each Attendee! We are excited to announce our all-new Young At Any Age Seminar-coming soon to your area! With free products, prize drawings, knowledgeable instructors and powerful take-home teaching tools, this seminar promises to be an experience you'll value immensely. P.S. Don't forget to invite your neighbors and other friends to this can't-miss event. They'll thank you for it! If you are not yet a Nature's Sunshine Member please give my sponsor #983219-3 when signing up for this class, so NSP will know that I invited you. Need invitations? Call or email me. Held at a more convenient time. Optional business module at no extra cost. 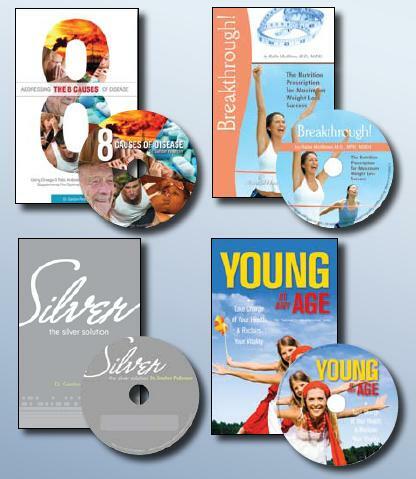 New booklets and CDs to help you educate others. Optional Business Training 3:30 - 4:30 p.m. Registration: Call 1-800-223-8225 to reserve your seat. If you are not yet a Nature's Sunshine Member please give #983219-3 (Karen Doolan) as your sponsor, so you can attend as my guest at the member price. 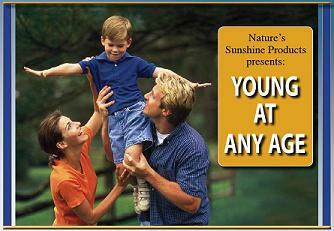 You may call me at any time to learn more about the Young At Any Age Seminars and Nature's Sunshine Products. Select the appropriate registration link below and complete the registration form. Non-NSP member guests please enter "Guest of Karen Doolan #983219-3" in the space that asks for your NSP account number. Please register for only one Webinar each day. Space is limited so be sure to register at your earliest convenience. You can participate by phone by calling the recorded number each day #712-432-0453 and use access code 8626#. No need to register. Each day's call will be available from at 6pm MST til the following day at 4pm MST. Each day at 4pm the new call will be recorded over the last call. NSP Members are asked to please call in on the number that is listed on their NSP account to get credit for attending via phone. Make sure to listen to the entire call, so you will get credit for listening. 5:00 p.m. 8:00 p.m. 10:00 p.m.
Jay Vanden Heuvel, Ph.D., and his wife Tracy are Regional Managers from Oneida, Wis. Since becoming a Manager four months after joining NSP, Jay became a powerful advocate for natural healing and continues to grow his business through quality education and dedication to his team. A talented consultant, Jay has helped numerous people obtain better health with Nature's Sunshine Products. Jay's humorous and enthusiastic style, make him a popular presenter with NSP. Steven Horne is professional member and past president of the American Herbalists Guild (AHG) and a professional member of the International Iridology Practitioner's Association (IIPA). He has also served on the board of directors of both organizations. An herbalist, natural health teacher, author and consultant, Steven's work has taken him all over the United States and Canada and to several foreign countries. Steven is the founder of Tree of Light Publishing, offering professional courses, charts, books, videos and other educational materials on natural health care. Judith Cobb has been with Nature's Sunshine since 1981. She is a Master Herbalist, Certified Iridologist (European Constitutional Iridology, IIPA), a Nutritional Consultant Practitioner (IONC), a Childbirth Educator and Certified CLEAR Practitioner. Judith has developed holistic healing courses, taught throughout Alberta, Canada, been a guest on radio and TV shows, published holistic healing articles internationally and given numerous presentations on various aspects of wellness to corporations. Valerie Greguire is a Certified Herbalist and Natural Health Consultant. Her search for health answers began at age 18. She discovered a small health food store in Page, Ariz., where she found information that changed her life. After six years of reading, studying and correspondence classes, Valerie started a two-year internship with a holistic nutritionist. She opened a consulting office, working closely with medical doctors and chiropractors. She was introduced to Nature's Sunshine and took Steven Horne's Master Herbalist program. Valerie quickly became a Regional Manager. Some 25 years later, she continues to work as a natural health consultant and as a consultant to chiropractic physicians and other health professionals. Clell Fowles graduated from the University of Utah's School of Pharmacy with a degree in Pharmacy and Medicinal Chemistry. Working as a pharmacist for 15 years, Clell brings a unique perspective on nutritional supplements and the proper role of herbs and natural products in health. During his time with NSP, Clell has published Drugs and Natural Alternatives and Drugs and Nutrient Depletion. He is currently the Manager of Health Sciences for Nature's Sunshine Products.has been with Nature's Sunshine since 1981. She is a Master Herbalist, Certified Iridologist (European Constitutional Iridology, IIPA), a Nutritional Consultant Practitioner (IONC), a Childbirth Educator and Certified CLEAR Practitioner. Judith has developed holistic healing courses, taught throughout Alberta, Canada, been a guest on radio and TV shows, published holistic healing articles internationally and given numerous presentations on various aspects of wellness to corporations. 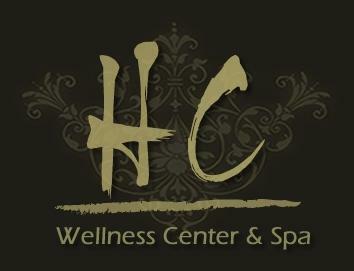 Thomas Easley is a Professional Herbalist with over 10 years of experience. At the age of 19, he opened his first store and began working on his own philosophy of herbalism. Thomas has studied extensively with Steven Horne, Phyllis Light and Matthew Wood—all professional members of the American Herbalists Guild. He has taught extensively throughout the southeast at herb conferences, nursing schools, medical colleges and more. Recently named one of the top 10 western herbalists in the world, he is considered by other professionals to be on the cutting edge of herbalism. Great education for you, your success line, guests, etc. *NSP Memberships are free with a $40 Product order. Who can attend? Anyone can attend. This is a great opportunity to introduce others to NSP. You must have an active NSP account to be eligible for the product credit and special promotions. Please note: Instruct your non-member guests to enter "Guest" as their account number. 3Managers must be registered and must qualify for the November Driven to Share promotion. Anybody may attend education week, but only active NSP accounts that register with their account number will be eligible for the product credit, and extra Driven to Share tickets. Invite guests to become NSP members prior to Education Week so they can take advantage of all the fantastic benefits! Please email or call me anytime with your questions or if you need help signing up for these classes.